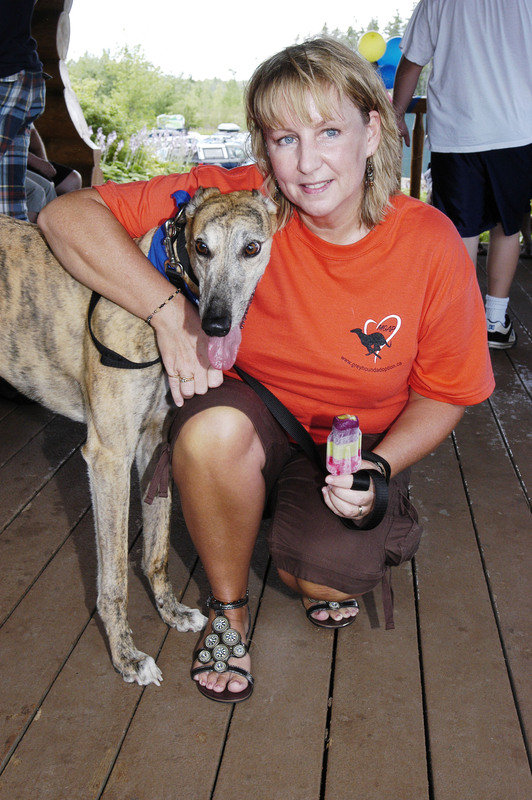 Deb Levasseur and her greyhound, Hughie. Have you ever thought of your dog’s behaviour as dominant? Ever thought your dog was trying to undermine your authority with its bad behaviour? Have you watched dog trainers speak about dominance on television and are now more confused than ever? Even between canines, so-called dominance is very fluid as dogs are never dominant over everything. For example, a generally submissive dog could love toys so much that he takes them from a more assertive dog. Dogs protect what they really care about and only need to control access when the resource is limited. If a household has enough resources for everyone, dogs do not have to compete for them. If some resources, such as food and water, were scarce they would compete to survive and the stronger dogs would win. However, this is an example of the survival of the fittest and has nothing to do with dominance. Some dogs, like people, are more assertive than others. This assertiveness should not be confused with dominance. Dogs are not egotistical, nor do they have the need for power and control. In most cases, describing dog’s behaviour as dominant is not accurate. Often behaviour problems believed to be the result of dominance are due to lack of proper training. Dog owners can be unrealistic in their expectations of their pets and label them as stubborn, dumb, or dominant when they do not readily comply. Keep in mind; dogs need many repetitions in many different places and situations in order to really know a cue. Dogs do not generalize well. Changing one small factor for a dog, changes everything. Some issues could also be related to stress or fear. For example, the dogs growls at you when you lay beside him on his dog bed; he is not trying to control his bed and be the boss over you, he may actually uncomfortable with you invading his personal space. The dog in this case could get yelled at, which would make him even more afraid of people in his space. Dogs certainly can have issues like guarding food and valuable resources such as the couch and this should be addressed as a guarding issue – not a dominant one. Raising dogs is much like raising children. Good parents do not use pain, fear, or intimidation in raising their children, and owners do not need these techniques to raise their dog. Dogs, like children, need clearly defined rules and boundaries and to understand the consequences of disobedience. Consequences must be fair and enforced consistently. Proper positive training techniques will increase a dog’s confidence, while poor training methods can damage the relationship between dog and owner. If an owner experiences difficulty training their dog, particularly when their pet is displaying aggressive behaviour, I would strongly recommend they seek help from a certified positive dog trainer. Keep in mind that science has come a long way from the Monks of New Skete who wrote the book advocating such methods as the alpha roll-over. Even they have re-written much of their theory so why are some people still buying into “alpha roll-overs, scruff shakes, staring the dog down, choking the dog, etc… to show him who is boss?” Going through doorways first or eating before your dog will not show him who is boss and will not promote leadership in your relationship. We have also discovered that when a wolf is seen over top of another wolf, the wolf on the ground rolled onto his back willingly and that packs are managed mostly by submission and not dominance. Dog owners need to be calm, assertive, and in charge. Dominance and leadership are two different methods to achieve this control. Dominance is the use of force through aggression to gain priority access to whatever an individual desires. Leadership, on the other hand, is the ability to influence the behaviour of others. A person can be dominant by bullying, or be a leader by providing incentives and rewards. Would you rather be forced or convinced? It’s no different for dogs. I believe most owners bring dogs into their lives for the special bond only dogs and humans share. Why risk damaging this unique relationship with dominance theory? Let’s remove our “dominance glasses” and see our dogs for what they truly are – animals that are trying their best to love us and live in our world but need our training and leadership.